08.05am – Was it not George Orwell who wrote about the ‘thought police?’ You see how the world has gone backwards? There was a time when, once upon a time, people were allowed to say what they thought. Do you remember when people used to say “it’s a free country?” It is by no means a free country. I have little time for the likes of Ken Livingstone or the late Tony Benn but their accuracy of history is without challenge. What the eff is offensive about recounting history? 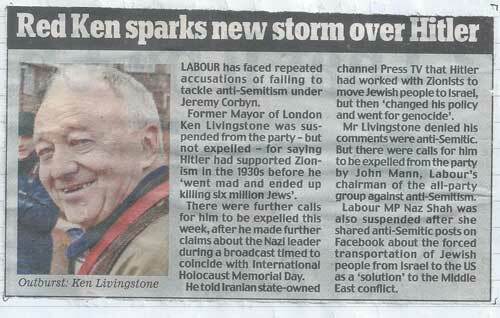 Hitler did support Zionism in the 1930’s until he went off the rails! King Leopold of Belgium had a cannibal regiment which solved his problem of an army marching on its stomach. No shortage of food there. Those are historical facts but what this country wants to do is to re-unite history, well I’ve got news for this country – if it continues down that line it will end up worse than the Nazis because the UK is killing off people’s individuality and progress. That’s why I say thank eff the UK is out of the EU. 07.42am – I hope Caroline will promote what I write next:- ‘I believe that everyone in every country should have respect for the law. In fact, I would even say they must have respect for the law. That being so, however, the law should/must be respectable too.’ The problem is, that the reason people do not respect the law, is because they believe the law is not itself respectable. The solution to a high crime rate is to review the law and to reduce the offences. If you look at for example ‘Archbold Criminal Pleading and Evidence/Practice’ see if you can find online the version of say 40 years ago – look at its length and size of the book. 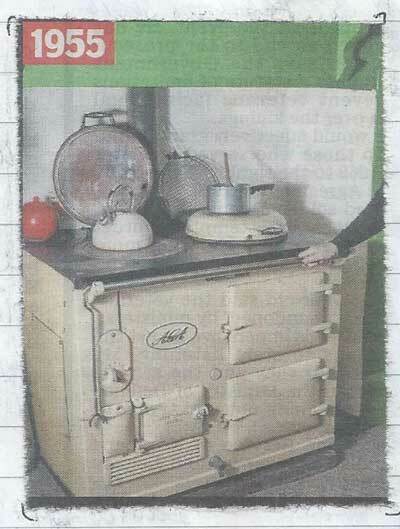 07.48am – The picture you see of an Aga cooker – you may ask why I have put it in my diary. Well, from 1962 until 1978 that is what I grew up with and how I learned the skill of making a fire with wet coal and firewood and boy did the cooking come good on it. The Aga warmed the whole damn house and I felt great. Then in 1978, we had central heating that cost £800 to install and although the Aga was still there it became superfluous. That was one sad day as it was the beginning of a new era – not necessarily good. 07.57pm – Despite my not being probably the very best qualified in the field of matrimonial advice may I say a few words about it. In any relationship who do you think holds the power? The man or the woman? The husband or the wife? You may well say it all depends on the circumstances! Does it? Do you think it’s about who goes to work and who stays at home? No – let me tell in any relationship who it is that holds the power:- the one that is least committed to the relationship. Do you know why? Because the one who is the most committed goes out of the way to please the one least committed! It’s got eff all to do with money, fame or whatever. It’s about commitment. Well, the same you can say about the State and its citizens. If the citizens are the least committed to the State by showing apathy and inertia, and imagine if, in any election, no one goes out to vote what power that would show? The State has exhibited it does not give ‘diddly squat’ (as Priti Patel MP says) about its citizens so for the moment it has the power. But when the citizens just show and exhibit apathy and a nonchalance attitude towards the State that is when the State will get the message. In the meantime just remember my words of wisdom – in any relationship the one least committed holds the power!!! 07.30am – Today is exactly 100 years that women over the age of 30 and married obtained the vote. What is important about that is how it was achieved:- Emily Pankhurst is remembered worldwide because she (like Nelson Mandela) invoked violence as a means of political achievement. The real person who actually achieved far more than Pankhurst was a lady called Millicent Fawcett but she wanted peaceful means only to achieving a political aim – the vote. Fawcett is hardly remembered and only Cambridge people like myself and those who now run the Fawcett Society know how important Millicent was to the movement. So you see in life only those who advocate terrorism or violent acts to achieving a political gain are recalled in history. Castro, Mandela, IRA, etc, etc. Even Churchill to some extent advocated violent disorders in dealing with commonwealth disputes. The American War of Independence – George Washington was a known terrorist because he opposed the rule of English law. Some say Jesus Christ too – well the jury is out on that. My point is that today I’d rather remember the peaceful actions of Millicent Fawcett than the violent outburst of Emily Pankhurst – I mean Pankhurst authorised the use of bombs and fire – can you imagine that today? Jeez, its hard enough even to make a controversial statement let alone today doing what Parkhurst advocated. 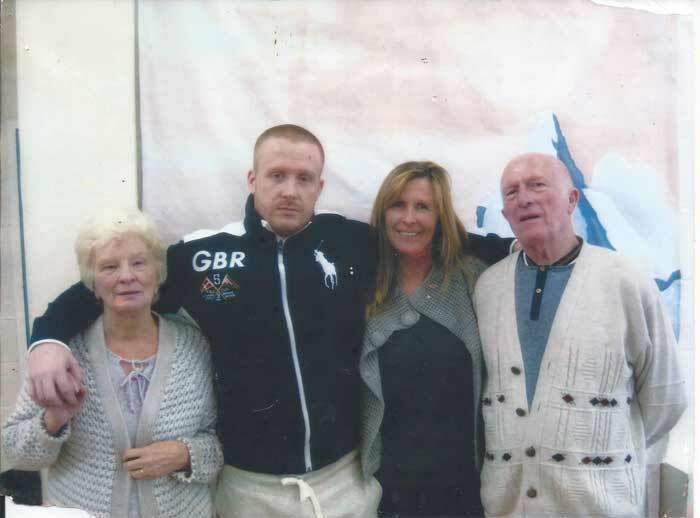 07.43am – On another note, well done to this prison’s Chaplains son Lauri Love for winning his extradition battle to the US. He may still feel the door bang behind him save that it might be in this country, not the USA. 07.24am – The last few years this country has posthumously pardoned homosexuals, war deserters and now calling for suffragettes to be pardoned. In 2010 to date I have called for Charles Stuart (Charles I) to be pardoned since his execution and trial was totally unlawful. Further, Charles I, has a direct line ancestry to Prince William and Harry through the late Princess Diana. How absurd that the future King of England has an ancestor that has been deemed a criminal, tried and executed when the whole process was unlawful. So I will yet again write and request a pardon for Charles I who certainly deserves it on a far more urgent basis. 07.29am – Yesterday I had a nice chat with the immigration officer. Things are moving as they say. 07.30am – Interesting to see a rocket fired into space that can stay up there for ‘a million years.’ who will be alive to verify such a claim and as a matter of interest who actually gives a damn? The money spent on space exploration is in my view wasted and should better have been used to build hospitals, schools and a better way of life. Make plans for a million years is frankly bizarre and absurd. For heaven’s sake start investing in planet earth, not space!!! 08.16pm – Jeez I’m tired as hell – is hell tired? Of course not! How can a place (if it exists) be tired? So why the hell do we say it? Who knows and now I’m more tired than before because I’ve written a load of drivel. I’m working four jobs here but it keeps me busy and I feel useful at least. I always try and do my best. It’s not always good enough but have to try. There is eff all on TV, also, which makes matters worse but thankfully I’m not dependent on TV so to me it’s no big deal if I have it or not. For a couple of days, I just listened to BBC Radio World Service. How informative but for youngsters they have no interest in anything other than loud boom boom music – urggggggggggggggh!!! Can’t think of anything worse. 06.34pm – I want to tell you about what happened to my friend Yasser Arafat’s wife Suha and his daughter Zahwa who was born (I think) in July 1995 in France. He met her when she acted as his interpreter when he visited France in 1989 on our MGM plane!!! Although there was a 30-year difference in age you would never think so seeing them together. When Yasser died France revoked her citizenship and she moved to Malta where she lives in peace and quiet and I extend my personal regards (I hope Caroline will send her a link of my diary)!!! That goes to show just how insensitive some countries are. I mean how can you revoke citizenship when a daughter was born there??? Absurd!!!! 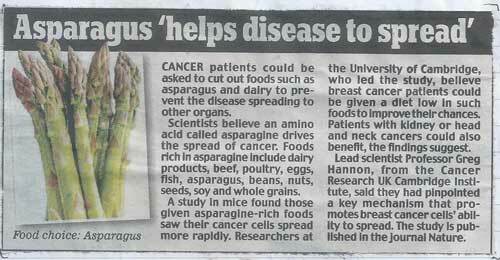 07.29am – I happened to find this article in the papers and – well – I detest asparagus and in fact, I do not take milk, beans, nuts, seeds, soy, and whole grains, yet I still managed to get prostate cancer even though I think I got it in check. I do eat – rarely though, because it’s not available regularly in prison, beef but do take chicken because that is on the menu daily here. Anyway, I hope at some stage in the future the mystery of why people get ill is solved I still take the views that cancer cells are actually aliens from another planet that are sent here to cull the human race. Can you imagine if all people lived indeterminately i.e. forever? Funny that because in Paradise one never dies but then again to get to paradise (purgatory or hell also) you need to die first!!! So how does that work out? I stand by my unproven theory that all forms of illness are actually aliens that penetrate our society and our bodies. Think it out and let me know what you think – in fact, lets have a poll. Re-read my article on my theory because it is only a theory after all!!!! Who do you think it refers to? No – not me for heaven’s sake but to GlaxoSmithKline and would you believe the Chief Executive is – yes – a woman called Emma Walmsley who is a 48-year-old blonde and a very nice lady. Only problem the company has a history of corruption and paying its way out of trouble!!! Lawful one eh!!! My diary content on Sunday 11 February 2018 refers to a ‘law for one’ regarding GlaxoSmithKline. They seem to have an ability to pay their way out of criminal responsibility. 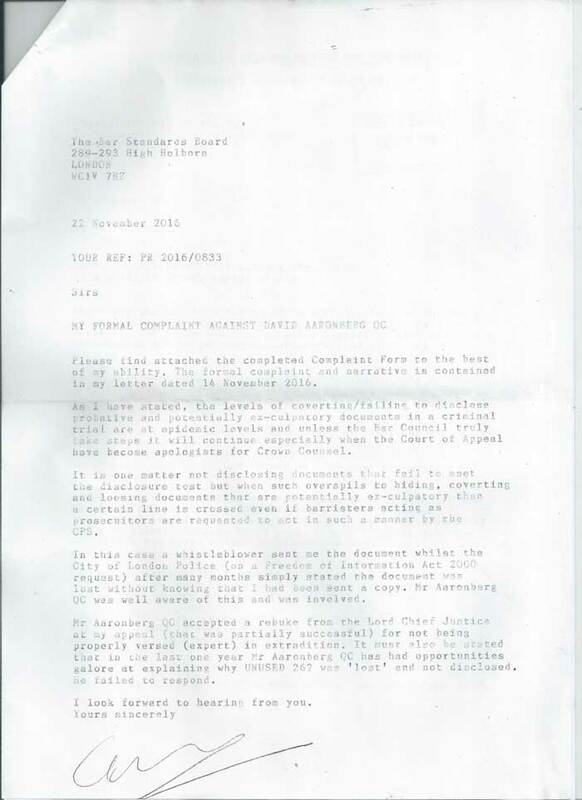 Today I attach correspondence to the bar Council and my referring David Aaronberg QC to them for investigation. Their stance was that they ‘never received my application’ but documents show a different story. 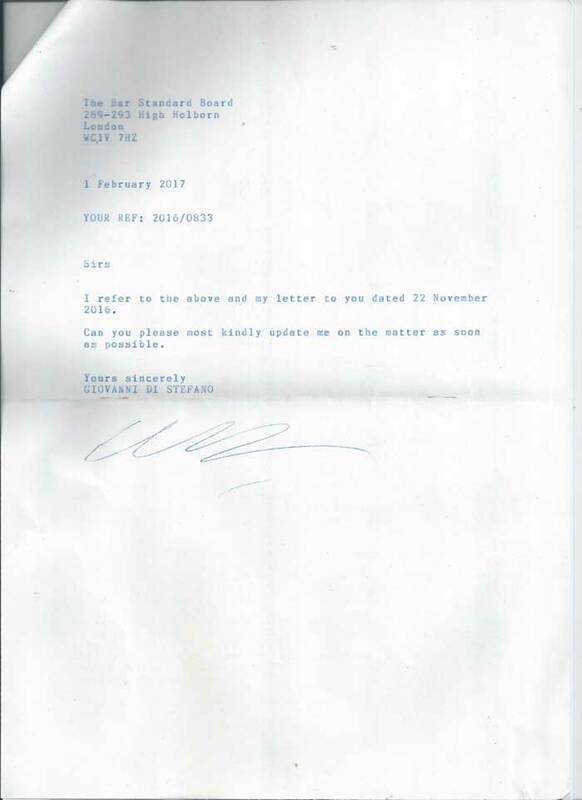 My letter was received by them on 16 November 2016! 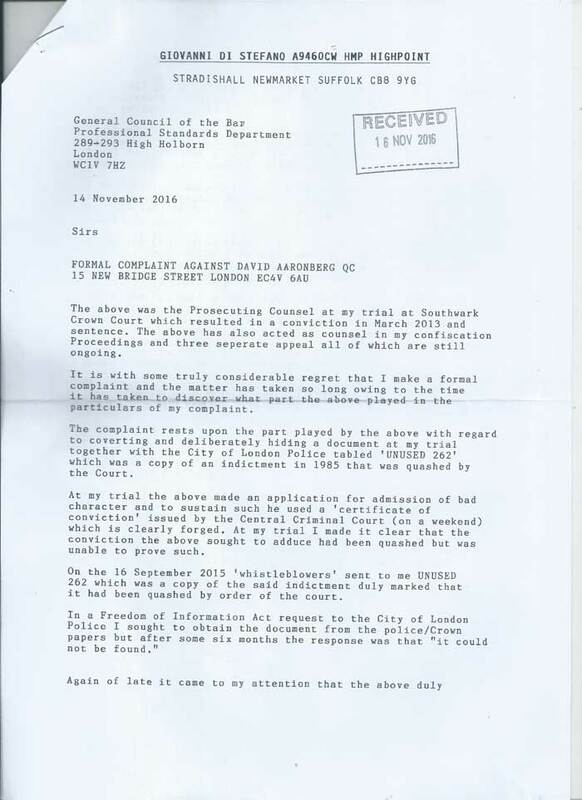 As a consequence of the Bar Council misleading me, the public, and natural justice, I was not only discriminated but Lady Justice Heather Hallett (thankfully now retired) used such against me at my appeal. I call upon the Bar Council to take immediate action and for an enquiry to be established as to this prime example of ‘one law for one’ principle. I call upon the judicial committee to investigate what happened at my appeal, and any prejudices that allowed a retired Judge to evacuate my appeal and why Lady Justice Heather Hallett (who knows me) was permitted to sit on the appeal presiding. 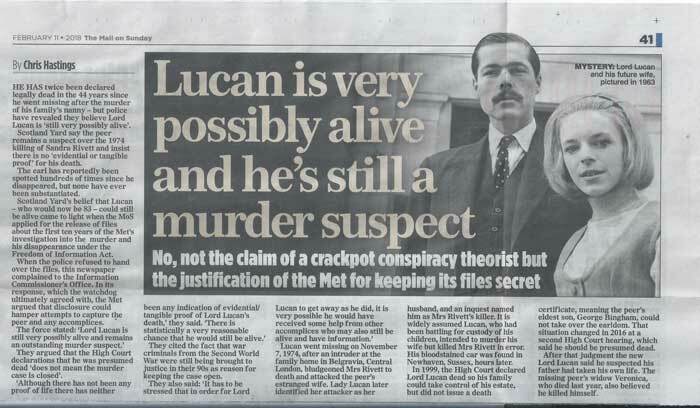 07.11am – Many years ago I published an article ‘Hollywood Hunk in Lord Lucan Scandal’ and I named a famous actor as the real person who killed Sandra Rickett at the Lucan home. I sent that article by email to the actors then political headquarters, and to Lady Lucan, and to the Met Police. The police refused to comment saying that as the enquiry was still ongoing and ‘live’ no comment would be made. I’m glad the Daily Mail continued by F.O.I request. Lady Lucan complained about a photo I used in the article and the actor turned politician! No comment!!! No denial just no comment. Need I say more!!!! 08.28pm – What a long day but worthwhile. you see whatever job I do I like to do it well and it makes no difference whether its running MGM with 2,000 employees or washing a prison kitchen. 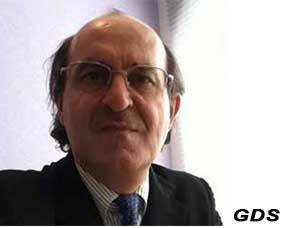 The same principle I apply – do the best you can and if anything goes wrong find someone to blame!!! 08.30pm – Now have a look at the news article chronology. 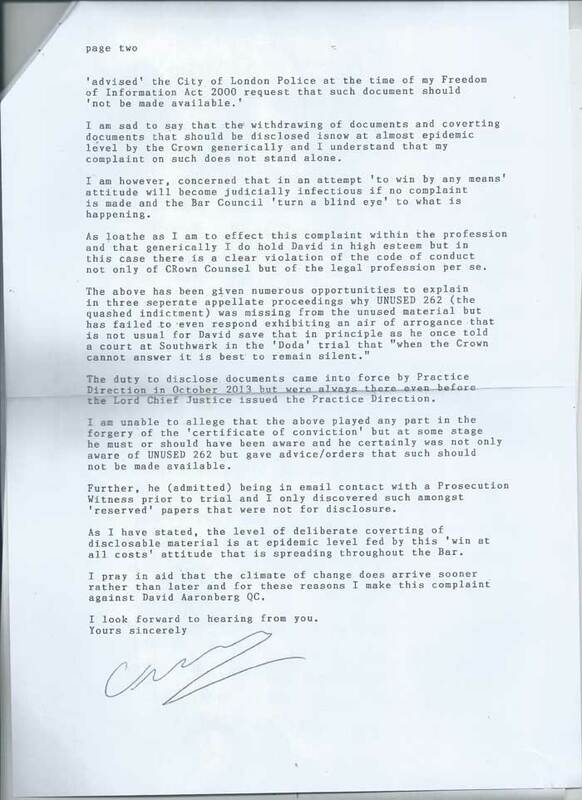 Look at the April 2014 part which says Clifford Chance ‘finds no evidence of Tomlinson claim.’ Now Clifford Chance, who has represented me in the past so I should know how they run, are a magic circle firm. Clifford Chance knew damn well what Tomlinson had claimed was not only true but it could be proved, but they were paid by RBS to prepare its own report which was never going to report that RBS were doing so much damage to their customers. In 2012 I brought their conduct and that of Nat West to the attention of the authorities on behalf of an Asian businessman who was also a Magistrate in Kent. The banks screwed him over and I accused them of fraud, but in March 2013 I came here but justice has finally caught up with them serving less time than me!!! 06.40am – Happy St. Valentines day to all! 06.50am – For some weird and strange reason last night I had a flashback to when my eldest son Mike was at St. Georges School, in Rome, and he was picked for the football team. It was one of the rare moments when I found the time to go and watch him play because, of course, big shot GDS was too busy to prioritise family before clients, anyway, it was a moment when he was so happy about me being there that just before he scored a goal he looked up to me in the stand and our eyes connected. Now, eff knows why I had a flash back to that but it was a moment when I knew my family had to come first but I just did not apply what my heart told me. Damn!!!! The whole thing about life is that you can’t fast forward or go back and do re-takes. The movie industry has made us believe we can but we cannot. I remember Deborah Moore (Sir Roger Moore’s daughter) said to me that the problem with film star daughters was that they saw their father on a screen 10 metres tall and what man could ever come up to that level!!! She was right, and in a small way I was a famous guy and my children all really needed, as did my Consort, not money, TV shows, or controversial sayings from me, they just needed time! That is why I have no time for the past and to a certain extent no time even for the present because if I regurgitate the past and swallow the present I will have no hunger left for the future. Eating all of a cake just makes you sick. That is why I believe in sharing!!! 07.19pm – Yesterday I felt a little shall one say ‘down.’ I don’t do depression but I also don’t deviate from others. I just don’t get depressed because I have too much to do and too much little time to do what I have to do it in! So depression – not for me sorry! 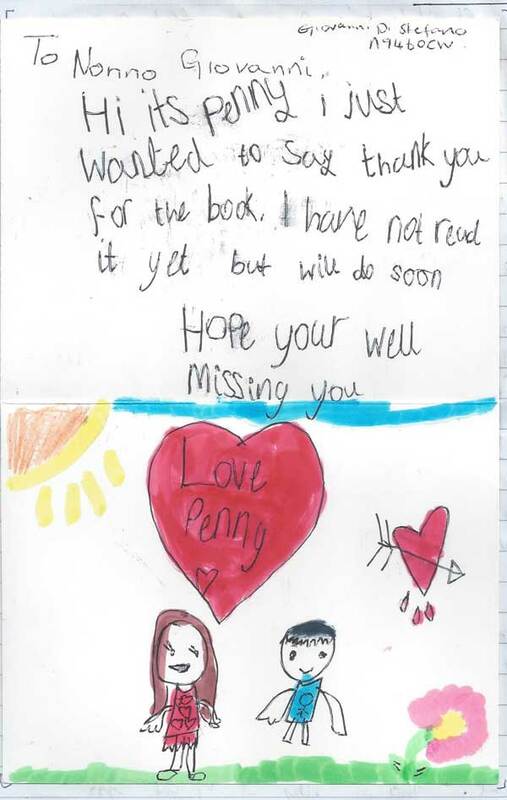 But I did feel a bit down and then I went through some old letters and my daughter’s daughter Penelope, my granddaughter sent me this card and it damn well cheered me up no end. How adorable of a little girl who has only seen me twice in her life to think of me in this way – you see blood is blood and it sticks no matter what!!!! 06.57pm – Here is another example of my grandchildren’s artwork to me. Today has been another of my ‘down’ days because, of late, there is no order and so life becomes confusing. People in prison need some form of regular agenda and there is none of late. So I must take some drastic action. 07.00 – Next week I will see Karen Todner and hopefully see what is going on – well, I know what is going on, I just need to wait. It’s hard though when things are so disorganised and all these youngsters here want to do is to play music loudly. I don’t blame them because that is all they know but its truly annoying for the bulk. Anyway, I hope soon to have a solution. 07.04pm – No post from anyone. Yesterday was my mothers 82nd birthday. Boy, do I miss her a lot. As a child, I used to contest my mother a lot, but as you get older things change and if I need anything now it’s my mother but she is a million miles away. 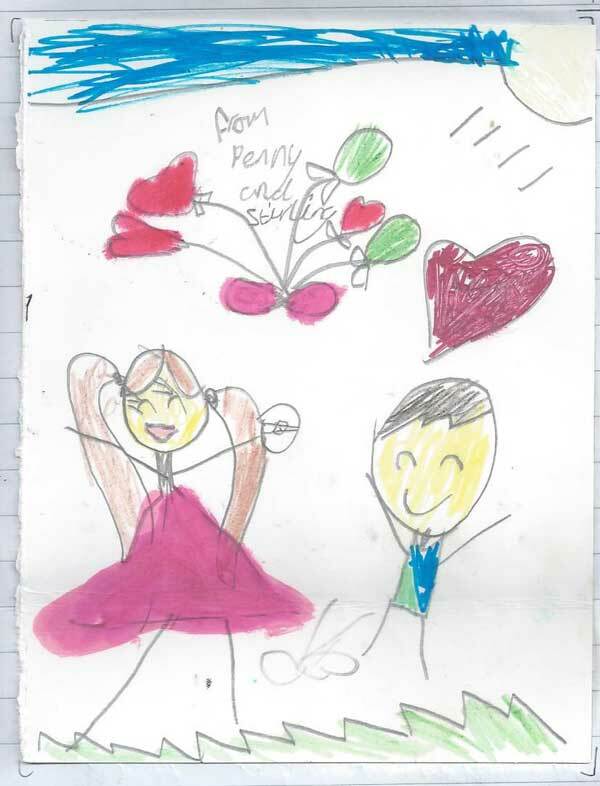 06.11pm – OK, call me what you will but I wanted to share what my grandchildren write to me. Only my daughters’ children write to me because the others are too young and Charlize who lives in Italy is too far away, but now and then I get hold of her and we have nice chat. What is nice about them in their politeness. It is one thing I did drill into my children that being polite opens many doors. Remember we as parents can only open a door – what the children do when they enter is beyond our control. Money also opens doors but again it’s up to the individual what he does when he/she is in! 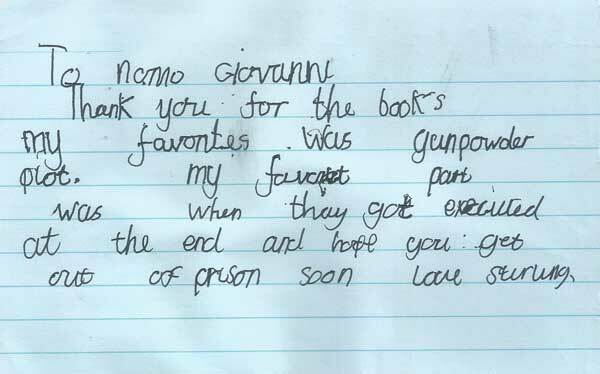 How nice of Stirling to write me such a nice letter and you can see the boy has a sense of justice – the gunpowder plot conspirators were all executed!! I don’t hide from my grandchildren that I am in prison. What is the point of hypocrisy, as I say hypocrisy is the tribute vice must pay to virtue!!!! John Sawers will only be remembered as the first head of SIS who had a photo on Facebook wearing his speedo swimming trunks!!! He has caused more harm from 2009 – 2014 when thank eff, he ‘vacated the position.’ You see, what not many know is that John Sawers jumped before he was pushed. Of all the heads of SIS (MI6) since 1974 John Sawers stands out to me personally as the worst and the one that took this country down. There! Said it! I don’t care what they say to me but I am entitled to my view as an insider, and one who knows and I won’t be silenced. 01.08pm – Feeling a lot better. Don’t know what the eff happened to me the last couple of days that I did not feel quite OK, and strangely a bit down. Not happened to me for – jeez – nearly five years. Next month I would have been unlawfully detained for 5 years. 08.04pm – Today has been one of those effing days I want to talk to no one and, in fact, I did not call anybody. There are times when I just think to myself what the hell am I doing here? 06.54pm – Yet another day when truly I do not want to hear from anyone so I called no one other than myself so, never mind.Tomorrow another day!!! 06.33pm – Today I met with Karen. Boy, oh boy, are things going good. I can’t really say much more but things truly, are moving in the right direction. As I said I’m going to say no more for now. 07.26pm – I need only to relax and wait a few more days before things will be much clearer. Let’s get this weekend over and done with, and then we can move on with a realistic plan which is not much different than previous. I have to learn to let go of situations and live my life. 06.48pm – Today was an interesting day. I went to church and prayed for my wonderful cousin Anna De Alto who died last week. I came back to the unit and found there had been a fire, and then as soon as it had started it finished by the afternoon all had been forgotten which is what it’s like in these places – today 1 tomorrow 10 the only difference is sweet eff all – a 0!!! 06.51pm – I’m including in this diary the photo sent to me by a totally innocent man and his dedication to me since 2013. Believe you me the guy is serving 30 years minimum and he is absolutely innocent 100000000000000000% I pray each night for him and his family and I am sure that soon, or at some stage, justice will be done and he can return to his family. (i) I received a message that what I had written about Sir John Sawers was not correct and that he had never been photographed in his speedo swimming trunks. 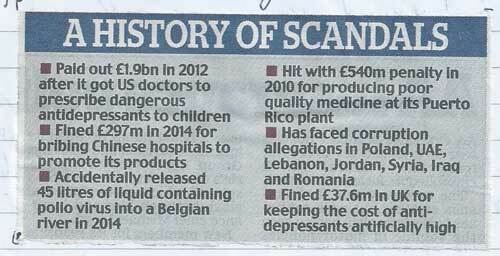 Well here is an article from Daily Mail 27 June 2014!!!! They have added more to what I knew so to the SIS who sent me a message that I need to check my facts, I have and I am always right!!!! (ii) Max Clifford now sadly deceased. Here is a news clipping that Max sent me last year asking me if what was written was correct. I replied to him and never heard more from him. I feel sad for Max’s family and I hope and pray that his daughter clears her father’s name as I hope my children will do for me.